Texas started four freshmen — including Jhenna Gabriel's first career start — in a sweep over Kansas State at Gregory Gym Wednesday (photo courtesy of texassports.com). AUSTIN, Texas — Fresh off of saying it’s important to keep the freshmen fresh down the stretch, Texas volleyball coach Jerritt Elliott gave freshman Jhenna Gabriel her first career start and it worked like a charm. As Elliott digs deeper into the roster and tinkers slightly in the final Big 12 Conference games, Gabriel notched 31 assists along with four digs in Texas’ sweep over Kansas State Wednesday at Gregory Gym. Four of the seven UT starters Wednesday were freshman. The Longhorns heavily outhit the Wildcats with a .386 mark to K-State’s .180 in the 25-19, 25-15, 25-19 win. No. 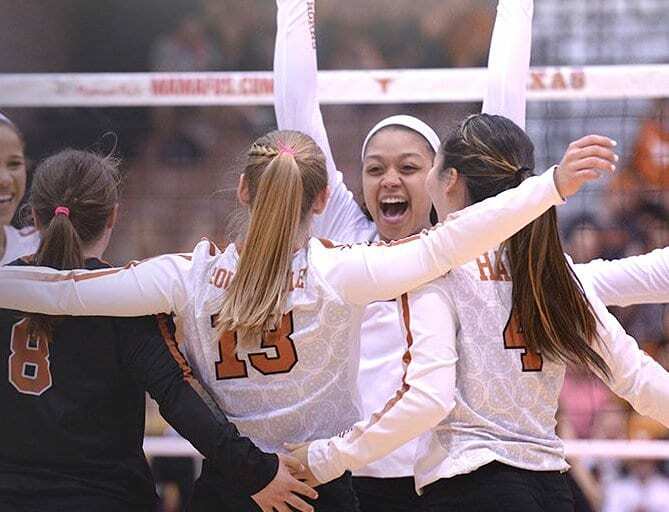 5 Texas is now 16-4 overall, 11-1 in Big 12 play, as well as 18-1 in 19 sets at home in Big 12 matches this season. Three more Texas freshmen were vital in the win, with Logan Eggleston tallying six kills, three digs, and a block, while Brionne Butler finished contributed five kills, four digs, and two blocks. Sydney Petersen had nine digs and two assists in the win. The locked-in veterans brought their A-game as well. Junior Micaya White once again led the Longhorns with 13 kills (.323), adding nine digs and one block. Senior Yaasmeen Bedart-Ghani had nine kills (.692), contributing one dig and one block, and senior Morgan Johnson added six kills on 10 swings (.400) with two blocks. Steady junior Claire Hahn led Texas with a season-high 10 digs, adding an assist, and junior Autumn Rounsaville had six digs and one assist. The second-to-last home match of the season is Saturday when Texas hosts Kansas looking to avenge a shocking road loss Oct. 10 to the Jayhawks. Get tickets here to see the 'Horns play Kansas at Gregory Gym Saturday at 1 p.m. CT.